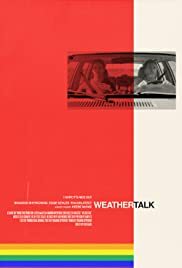 Weather Talk is a short film depicting the strained relationship between a son and his father as they drive together across the United States. The film is a coming out story and centers on the new bond formed between these two estranged people. Alex and dad drive together from Fargo, North Dakota to Los Angeles, California where dad will receive treatment following his heart attack. On the road they get to know each other for the first time and gain a closeness they never had while Alex was growing up. Just before reaching Los Angeles Alex faces the final hurdle in their newly formed relationship - his coming out.